This wonderfully creamy natural deodorant We've Got The Heat! is made with organic shea butter, jojoba oil, baking soda, organic orange oil, tea tree and lemongrass. The deodorant gives good protection, is moisturising and super refreshing. The deodorant is 100% natural and easy to apply. The fluffy cream spreads easily and is very mild and caring. The deodorant comes in a glass jar with a plastic screw cap. Do you want to reuse the jar? Come to our store for a refill! Use: apply a small amount of cream (the size of a pea) under your armpit with your fingers and spread out gently. You are protected for the whole day! At temperatures starting from 40 degrees Celsius this deodorant can melt. Keep this in mind when you travel. In the Dutch climate there is nothing to worry about and the deodorant remains a cream. Is the deodorant melted? No problem, just stir for use! This does not influence the effect of the deodorant. This natural deodorant contains only a few natural ingredients and contains no aluminum and parabens. Organic Shea Butter (Butyrospermum Parkii nut butter), Organic Coconut Oil (Cocos Nucifera oil), Corn Starch (Zea Mays Starch), Baking Soda (natriumbicarbonaat), Jojoba (Simmondsia Chinenis), Organic Sweet Orange (Citrus Sinensis Oil), Lemongrass (Cymbopogon flexuosus Oil), Tea Tree (Melaleuca alternifolia Leaf Oil). 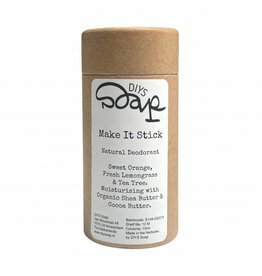 Make It Stick is a natural deodorant that actually works. Smell lovely all day with this convenient, easy-to-carry stick. Biodegradable packaging and no more plastics! Wonderfully creamy and fresh deodorant, 100% natural, very moisturising and gives a good protection. Wonderfully creamy and fresh deodorant, 100% natural, very moisturising and gives a good protection. Great for lavender lovers, reminds you of fields filled with lavender!